A rare and characterful three storey Victorian family house currently offering a good layout and decorative finish but with huge scope to adapt and improve. There are obvious possibilities to open up the kitchen space onto the garden. The house has ample reception space over two floors with a double reception room on the raised ground floor and a versatile professionally soundproofed room to the front of the lower floor - ideal as an office, playroom or generous fourth bedroom. The building is nicely set back from the street and has entrances at both lower and upper ground levels, as well as plenty of storage space. Internal light is excellent and these houses are unusual in the fact that they are only partially attached on either side. Starfield Road is a friendly family orientated street just off the southern end of Askew Road. Independent local shops and great restaurants are minutes away, as are both Wendell and Ravenscourt Parks.The area offers numerous good schools and of course the shopping and transport hubs of Hammersmith Broadway and Westfield. 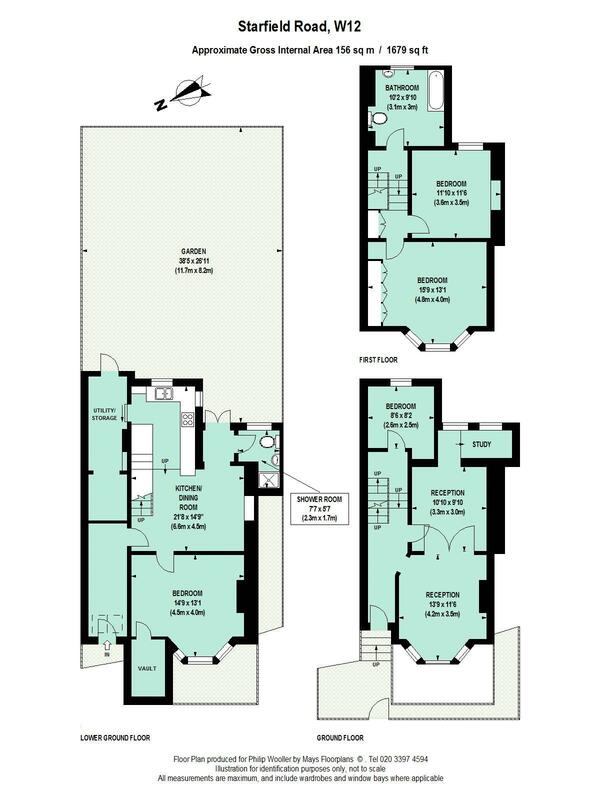 1679 sq ft / 156 sq m approx.